Afghanistan through My Eyes - Green Bean Anyone? On some of the bases in Afghanistan there are PizzaHuts but for the most part FOB's and COP's don't get a lot of fast food. We rely on the DEFAC for everything. It's pretty good, there is always fresh lettuce for salads, a choice of meats, chicken made over in several ways and pudding. Usually, a huge tub of vanilla pudding that I play a game with. I would always wonder at each meal, what would the tub of vanilla pudding be put next too...it never made any sense and would show up next to the salad, bin of hard boiled eggs, next to the bacon, who knew where it would appear. It was one of my only sources of entertainment. Pretty bad huh! We also always had ice cream, curtesy of Baskin Robbins. We could make sundaes and top cake or pie with it. Some got creative and put the ice cream between two cookies...one person who shall remain nameless, but is infamous for this, tried to toast his chocolate chip cookies first...which made more than a big mess. You know when your FOB really has made it when it gets a Green Bean coffee shop. They serve a mean espresso chai latte. The best place to be to learn what is going on is at the Green Bean. Most times I would get the scoop on information and arrive at the PAO in the morning asking questions. Everyone hangs out at the Green Bean smoking, playing pingpong or pool or watching a movie or the news on the TV inside from it's opening hours to it's closing moment's. I'd like to say you could close your eyes, sip your latte and imagine you were someplace else with the sun kissing your face and a cool breeze, but then a helo would land or you'd hear the unmistakeable sound of a drone taking off or the gunfire would bring you right back to the war. 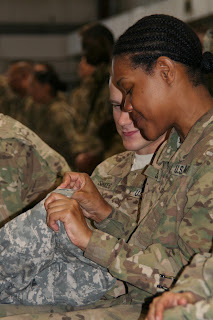 Fenty has lots of Afghan's on base. They are all very considerate of the military and embrace the American way of life. They run the Haji shops that sell everything from pirated DVD's for a few dollars to handcrafted fine jewelry. Mahmoud at Mohammad's designs and crafts the best jewelry here on FOB Fenty. He wanted me to say how he wishes everyone gets peace and to thank the US Military. Rasul works the other side of the shop selling everything else. Here is an amazing selection of carpets. 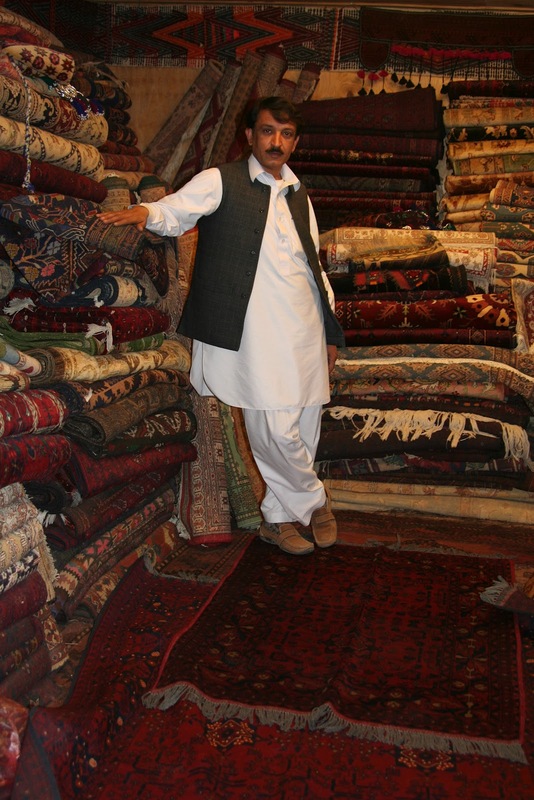 The silk carpet the proprietor is standing on is one I liked, but at $900.00 it was too much for this poor writer. Unfortunately I've misplaced his business card while unpacking. Mujahid, Mohammad, Nadar and Sangar run the laundry. There are tricks to making your laundry come out better, like add your own detergent in your bag. But they do the best job they can with the water quality they have and if you're nice they'll do a pretty good job folding. The turn around time is 24 hours and it's free. Of course there's always the pen that gets left in and ruins everything...like my last load. It's an interesting community on a FOB. At Fenty we were honored to have Sergeant Major Raymond Chandler the 14th Sergeant Major of the Army come and give a town hall meeting for the soldiers. He presented his coin to soldiers of merit and also gave all the soldiers an opportunity to ask questions. 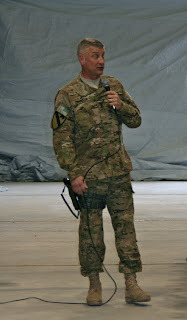 He talked about all kinds of issues from sexual harassment, to PT (physical training) standards and even brought a prototype of the new uniforms. A soldier gets the opportunity to inspect the uniform up close and personal. Soldiers at ease with their coins. The SM spoke about the imminent changes in the Army because of the downsizing. Soldiers who don't pass the standards will be out. He encouraged all the soldiers to work as if they wanted to earn a promotion if they wanted to stay in. Lean and mean is what I'm saying. I like it.